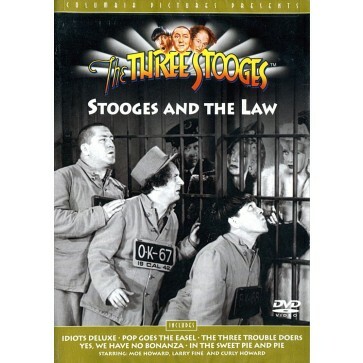 Idiots Deluxe (1945): Testifying from the witness stand, Moe defends himself against Larry and Curly's accusations that he attacked them while camping out in the woods, claiming they were responsible for frazzling his already frazzled nerves. Pop Goes the Easel (1935): The Stooges paint themselves into a corner when they hide from a cop in an art school. Accused of stealing brooms from a shopkeeper, they're actually innocent of that crime ... but now they're guilty of creating some really bad art. The Three Trouble Doers (1946): The Old West gets wilder than ever when the Stooges are enforcing the law. After Blackie kidnaps Nell's pappy to force her to marry him, Sheriff Curly and Deputies Moe and Larry will have only until sundown to save the day. Yes, We Have No Bonanza (1939): Larry, Moe and Curly strike pay dirt - literally - while prospecting for gold to pay off their girlfriends' father's debt to Maxey, the wicked saloon owner they all work for. But when they find out the money is Maxey's stolen loot, it's payback time.